EastBanc, the creator of many of the finest luxury condominium projects in the Capital, has presented our clients with an amazing opportunity at their newest property — the dazzling Westlight, a 10-story gem under construction on 24th Street in West End. After selling out all of the one bedroom units in the building, one has come back on the market because the original buyer is moving up to a larger unit. Offered at $775,000, this opportunity won’t last. Schedule your private viewing. Or call us now at 301.442.8433. Life At The Top can get you in. Westlight was envisioned by the famed Enrique Norten of TEN-Arquitectos. The building’s facade extends outward and upward beyond the property line as it rises to its ten-story height above 24th Street. The breathtaking cantilevered glass façade reveals residences bathed in natural sunlight through floor-to-ceiling windows. 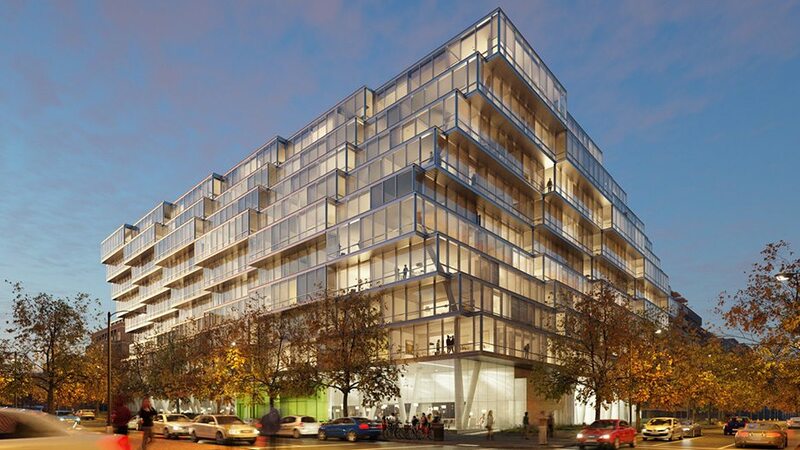 An “It” Building in five categories, Westlight offers the luxury of truly modern living in one of DC’s top locations. Large floor plans will have buyers trading grass for glass! Amenities abound including Euro-chic kitchens with natural gas cooktops, Italian high-gloss cabinetry, and quartzite countertops. Spa-inspired bathrooms feature IPE custom teak shower floors, Italian high-gloss cabinetry, Waterworks fixtures, and Toto toilets. Panoramic penthouse views encompass the National Cathedral and Washington Monument. Westlight is the centerpiece of a LEED-certified building that will include a new public library, retail and an attached East Tower of 93 luxury rental apartments. The spectacular lobby captivates owners and guests with a 50’ living green wall and exquisite lighting sculpture by award-winning artist Ingo Maurer. On the rooftop, residents can enjoy a 25-meter heated swimming pool, and an expansive sundeck with green space and grilling stations. West End is easily one of the most sought-after neighborhoods in DC and sits walking distance to the best of Georgetown as well as Dupont Circle, Foggy Bottom and the Waterfront. Westlight is surrounded by shops, including Whole Foods, Trader Joe’s, drug and hardware stores. Over 200 restaurants, numerous hotels, movie theatres and performing arts venues including the Kennedy Center are nearby. Two Metro stops within a three-block radius provide easy access to Capitol Hill, downtown offices, museums and national monuments located on the Mall, along with close proximity to the major suburbs. Take my word, it won’t be long before all units are going to disappear fast at Westlight. I urge you to schedule your private viewing now, or call us now at 301.442.8433 and see this incomparable building for yourself.